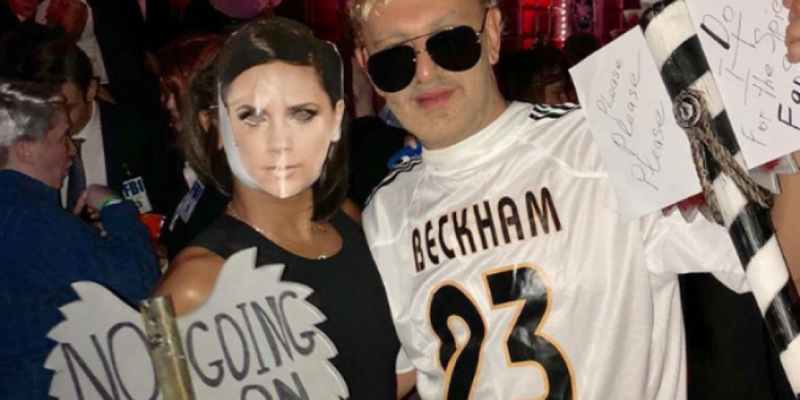 Mel B has just further confirmed that Victoria Beckham will not be touring with the Spice Girls, with her bizarre Halloween costume. Scary Spice sported her Posh Spice get up last night at a New York Halloween Party. The singer wore a Victoria Beckham mask (that looks a tad battered) and held a sign that read 'No I am not going on tour'. She was joined by her friend Gary Madatyan who also dressed as a Beckham. The celebrity hairdresser took the role of David Beckham and wore an LA Galaxy football shirt with Beckham spread across the chest. He held a sign saying 'please please please, do it for the spice fans'. It's doubtful that this will change Victoria's mind!